A new program under the Frost Preparatory Program. Deadline to apply is March 17th, 2019. 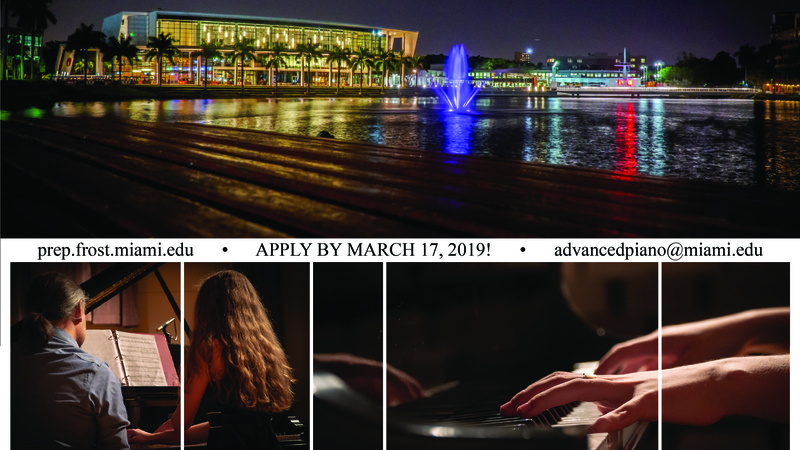 The Frost School of Music at the University of Miami is pleased to announce the Advanced Preparatory Piano Program, an exclusive program for piano students who are ready for more intensive and immersive studies to prepare them for a career in the music. Applicants must submit the application form online (where they can upload resume/bio and video recording links) and pay the $50 application fee by March 17, 2019. There is a pre-screening selection after applications are submitted followed by a live audition on April 27. The applications and timeline can be accessed via the following link: https://prep.frost.miami.edu/programs/advanced-piano-program/apply. The program is rigorous in the admission selection as well as in nurturing of talents. It offers a comprehensive curriculum that allows students to develop technical and artistic abilities at the highest level. As such, students’ commitment will be essential for their standing in the program.